The crooked neck of this squash is the best part. Cut it in slices an inch thick, take off the rind and boil them with salt in the water; drain them well before they are dished, and pour melted butter over – serve them up very hot. 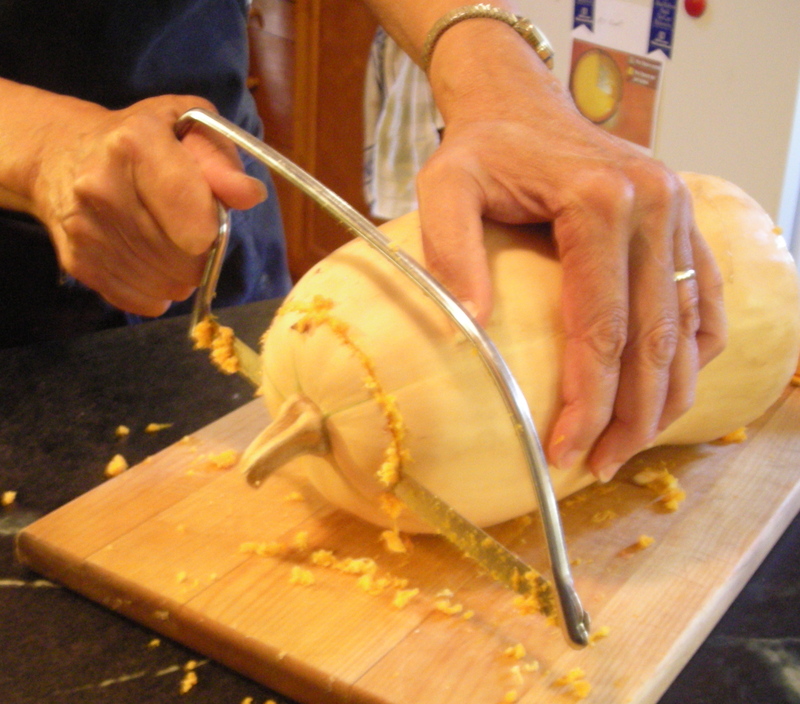 As you can see from the pictures you will need a good sized knife to open the squash. 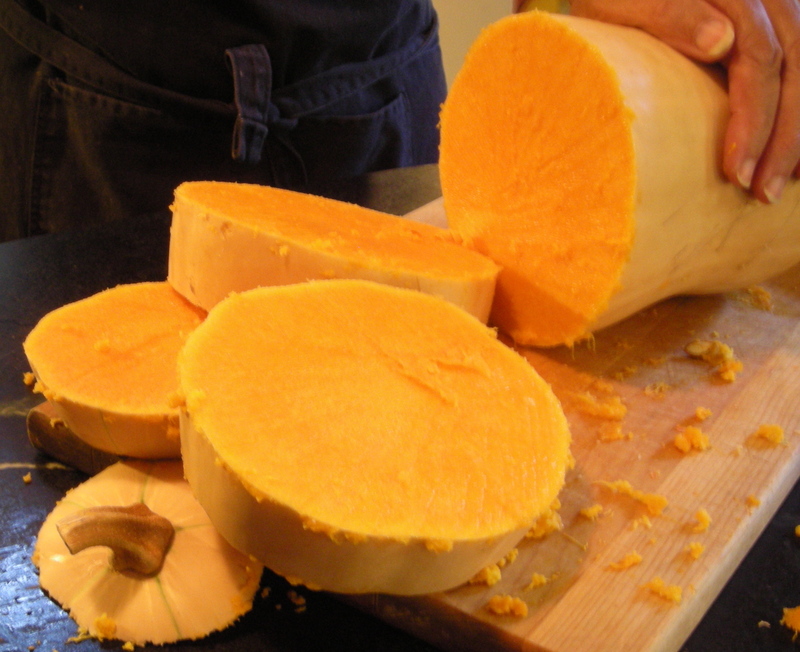 Work on a surface covered with a damp dish towel to prevent the large squash from slipping as you cut. I make my slices a bit thicker than an inch and I also like to dust the cooked squash with a grating of fresh nutmeg; or you could get savory with finely chopped sage or rosemary. MR’s directions for the pureed version calls for a sieve but you can just use a potato masher. The results will be a bit chunkier. Regarding the pork chop suggestion she means the finished stewed squash is ‘excellent’ when served alongside pork chops not actually cooked with them. The pureed version is also excellent as a pie filling when combined with sugar, spices, eggs, and milk. 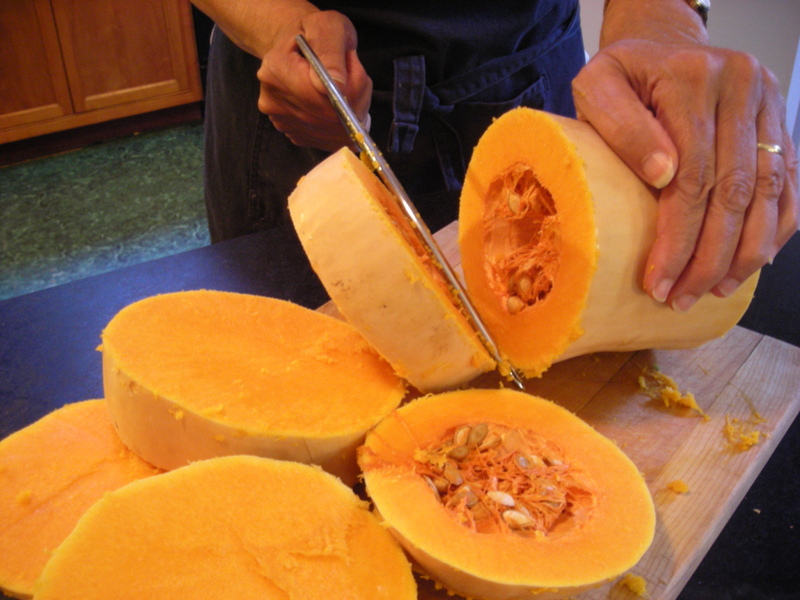 Scoop out the seeds from your squash and rinse them in a bowl of cold water to separate them from the fibers. Spread the clean and drained seeds on a lightly greased cookie sheet and roast them at 350 for 20 min for a nice crunchy treat the Mexicans call as ‘pepinos.’ Or you can also just dry the cleaned seeds and save them to plant in your next year’s garden!